The National Police’s Traffic Corps launched the e-Tilang app across 17 provinces in the country, including Jakarta. First introduced in the market in October, the smartphone app allows traffic violators to make electronic payments for fines incurred for minor traffic violations. Earlier this year, the Indonesian government made it publicly known that it was going to make an aggressive move against the widespread corruption across law enforcement agencies and the entire bureaucracy. Among the strategies that has been outlined was the introduction of measures that will prevent bribery, which is apparently a prevalent problem in terms of collecting traffic fines in the country. 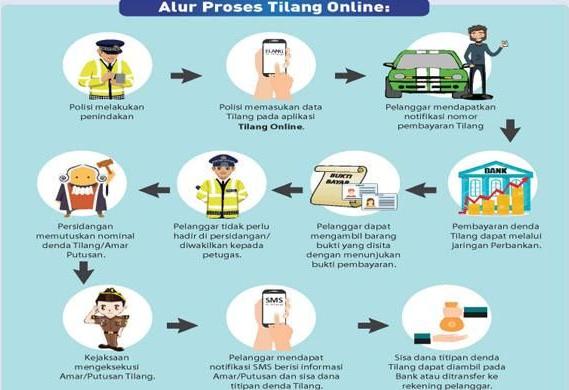 In line with this, the National Police has initially launched the smartphone app e-Tilang across 17 provinces, before finally having it available to the rest of Indonesia in the next few months. The innovation enables traffic violators to make electronic payments of fines without the need to go to court. Chrysnanda Dwi Laksana, grand commissioner and head of the law enforcement department of the country’s National Police, told reporters that their department is hopeful the app will help lessen (if not eliminate) the bureaucracy and minimize the manual processes involved in traffic ticketing. minimize the manual processes involved in traffic ticketing. When a registered e-Tilang app user commits a traffic violation, he will receive a unique code through the app from the traffic police officer. The code will reflect the violation and its corresponding fine. With the code in hand, the user will be able to pay the fine through their account from Bank Rakyat Indonesia via an ATM or any online banking platform. The user will then show the payment receipt to the officer to be able to retrieve his driver’s license or other confiscated vehicle registration documents. In the event that the maximum fine paid for the offence is more than the actual amount of fine for the violation as decided on by the court, the user should receive the refund on his bank account. The e-Tilang app is available for download on Android smartphones.